Rye number eight Rory Creavin breaks from the back of a scrum in their 7-15 win over St Leonards Cinque Ports. Picture by Ceri Ap Bryn. Rye Rugby Club managed to overturn an early score by St Leonards Cinque Ports to win 7-18 on the road and earn their third win in as many matches, climbing to sixth in the league and level on points with local rivals Ports. On a day beset by terrible weather it was the forwards of each team who had the biggest bearing on the outcome, Rye’s trademark expansive play being tempered by driving rain and gale force winds. An early retirement from Irish loosehead Stephen Cooper meant a reshuffle in the tight five and lock Tom Pierce taking his place in the front row. This led to a cagey opening 20 minutes that was peppered with handling errors from both teams and it was an uncharacteristic spill from reliable Rye centre Richard Turk that lead to the hosts taking an the lead. Strong carries from Pierce and Rye stalwart Andy Brown made the hard yards and put the New Roaders on the front foot and in Cinque Ports’ 22. A driving maul as result of Rye’s consistent line out marched towards the line before Pierce was deemed to be held up over the line. Scrum down on the Cinque Ports five-meter line and Rory Creavin was ready to pick and go - try time Rye. Jackson Harvey maintained his fine form with the boot making it 7-7 in the torrential rain before the half-time whistle. 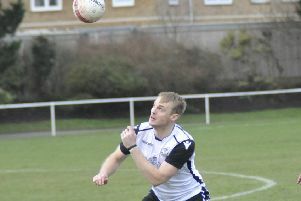 As the second half got underway the cavalry arrived for Rye in the form of player/manager Dave Smith and Tom Conneely who both added experience to the squad. Neither team however managed to string together successive phases and it was Rye who decided to kick for points when in the Cinque Ports half. Man of the match, returning scrum half Toby Aylett took the score to 7-10 before another line out from Rye lead to a try for back row Dave Smith. After winning the throw Rye threatened again to set up a driving maul causing the defending team to step away. Entering in to game of thinking forwards chess, Smith backed towards the Cinque Ports’ line without support whilst the defence divided like the Red Sea. Smith however was going solo and promptly dived over unchallenged to take the score to 7-15. Again Rye found themselves with another chance at the posts and with the clock winding down decided to kick for points to put the game beyond reach of the hosts. Aylett concerting the penalty with aplomb to secure a 7-18 win. Captain Alex Turner said: “It was a great performance from the lads today in some diabolical conditions. Each and every player put in a shift today and to come back and win on the road will give us a lot of confidence as we head into the business end of the season. “Toby made a big impact on his return from injury and its great to see him back in Rye colours. It’s a shame Stephen Cooper had to withdraw from the game early due to injury and doubts remain over his availability next week against Hellingly, but we do expect to have a full squad regardless”. Rye welcome mid-table rivals Hellingly to the New Road this coming weekend, kick off at 2pm. Training continues weekly from 7pm on Thursday at the Rugby club on the New Road (TN31 7LS). For further information please email Ryerugbyclub@gmail.com.